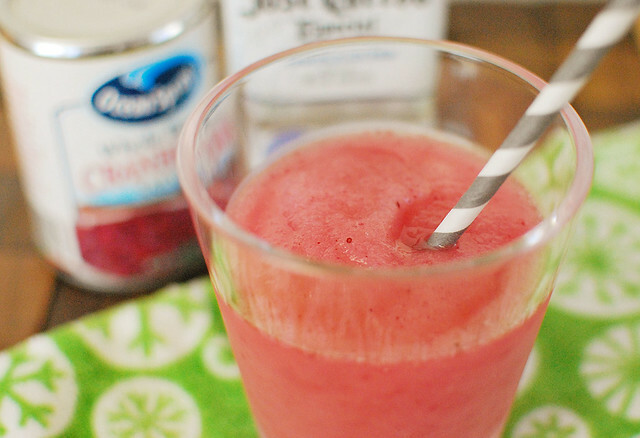 For this week’s Thirsty Thursday theme, we went with… CRANBERRY! Just this week I spotted fresh cranberries at my grocery store so it’s perfect timing. 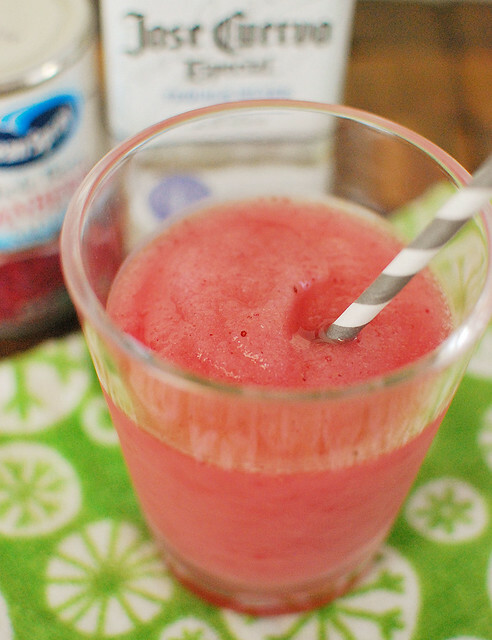 This Frozen Cranberry Margarita is a great recipe for Thanksgiving or even the day after Thanksgiving because it uses canned cranberry sauce! Weird, right? So if you’re left with an extra can of the stuff, you can definitely do something besides cover a turkey sandwich with it. 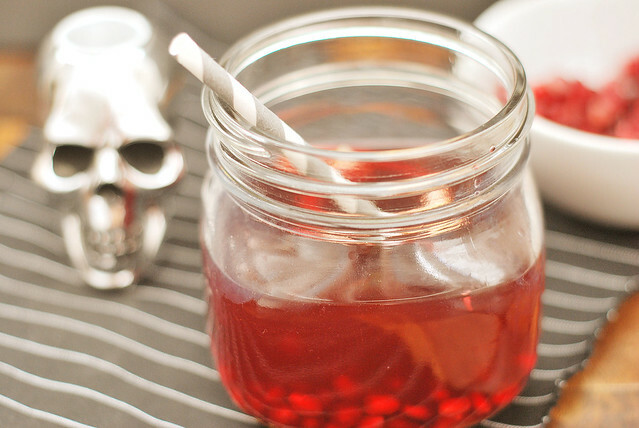 Between all the tequila and the tart cranberry sauce, this drink has quite a kick. In a good way! 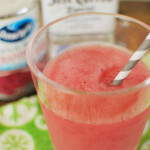 Those frozen margarita mixes can be way sweet so those two together keep the drink from hurting your teeth. Make sure you check out what Nicole made! Put margarita mix, tequila, cranberry sauce, triple sec, and lime juice in blender. Fill with ice to 5-cup lever. Blend until smooth. Serve immediately. How disgusting is this?! I just love it! Nicole and I decided that for the next 2 weeks we’ll be sharing Halloween drinks, one boozy and one kid-friendly. I’m starting with the boozy one. Of course. This blood red cocktail is a mix of pomegranate juice and whiskey that’s garnished with pomegranate seeds which look like bloody teeth hanging out at the bottom of the glass. So gross, so fantastic. I want to throw a Halloween party just so I can serve these! I am not a whiskey drinker but I did like it in this. I made my second one (I watched the debate while I drank these – you can’t fault me) with tequila and it was every bit as good. So switch things up as much as you want. Just make sure to use enough pom juice to get that gorgeous blood red color. Nicole made a Slime Rickey! How cute is the name?! I’m dying over it! And just wait until you see it! She uses frozen grapes to look like eyeballs! Put sugar and water in a small saucepan; bring to a boil. Stir until sugar is dissolved. Remove from heat and cool. 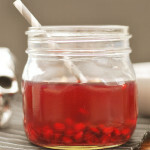 Place whiskey, pomegranate juice, simple syrup, lemon juice, and ice in a cocktail shaker. Shake vigorously and pour into a glass. 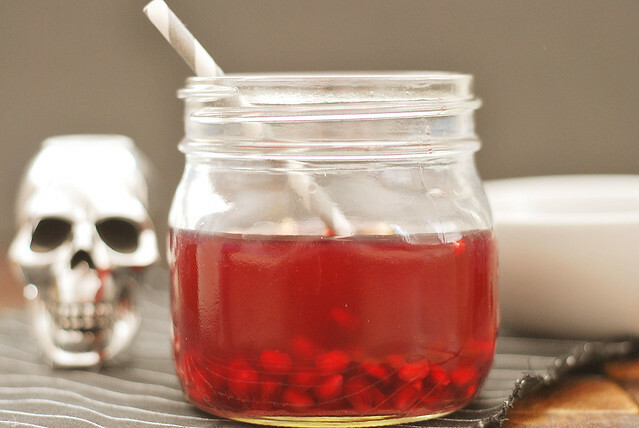 Garnish with pomegranate seeds and lemon twist. I think I am the last person in the universe to jump on the honeycrisp train. To be fair, I bought some years ago (at The Fresh Market for probably $6 a pound) and they tasted like water. So I’ve avoided them until this year. Just this week though, they were the cheapest apples at my grocery store (and GINORMOUS at that) so I bought them and they are amazing. Seriously, crisp like I didn’t even know apples could be! I haven’t told you guys but Nicole and I had so much fun doing our s’mores week that we wanted to do something together every week. And we decided on drinks because… well duh. If there’s one thing I’m good at, it’s drinking. So for the next little while we’ll be doing a themed drink each week! Get excited. 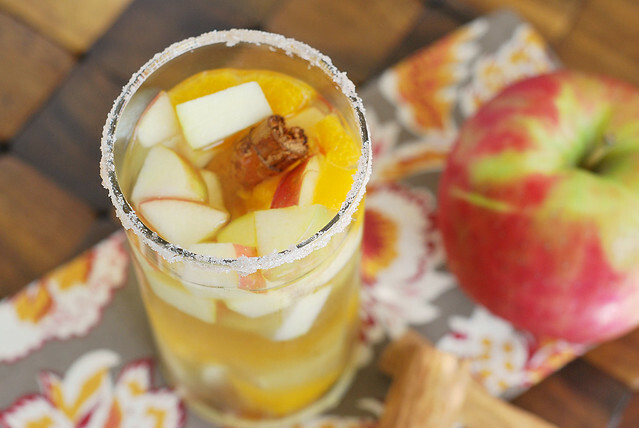 Apples were the theme of the week and I’ve had this sangria on my “must make” list since Brandy suggested I try it one night when I was whining on Twitter about how I hated wine. It specifically calls for honeycrisp apples and since I’d just bought 15 pounds (seriously) of honeycrisp, it was perfect! I love, love, loved it! The original recipe calls for an unoaked chardonnay but I used a moscato because it’s the only wine I drink really. 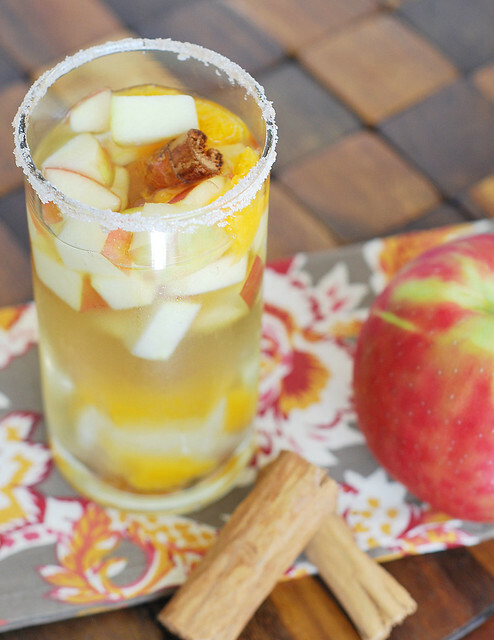 It’s so delicious and so different from your regular sangria since it has ginger and cinnamon sticks and cloves in it. 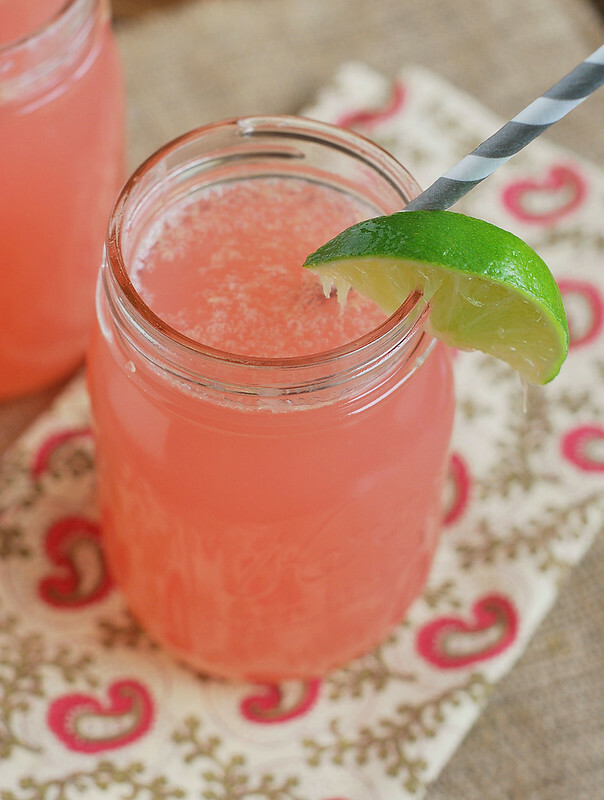 It’s cool and refreshing but warming and holiday-esque at the same time. Nicole made an Apple Pie Cocktail which I will be making real soon! Yuuuum! Peel and chop one of the apples. Quarter one of the oranges, the lemon, and the lime. In a large bowl, combine the whine, schnapps and honey. 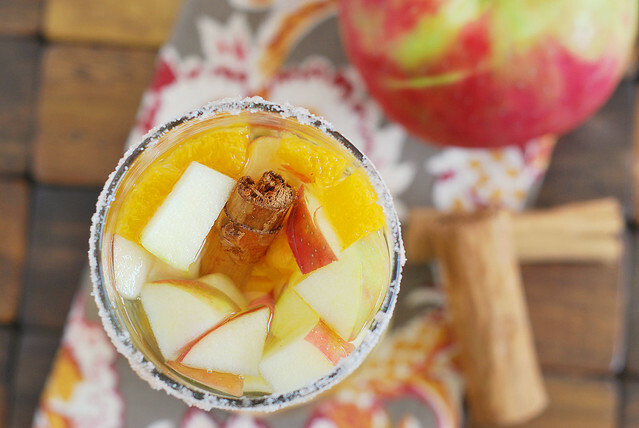 Stir in the chopped apple, the quartered orange, lemon, lime, cinnamon sticks, ginger and cloves. Refrigerate it overnight (or at least 4 hours if you're in a hurry). Strain the sangria into a pitcher. Chop the remaining apple. Peel, section and chop the remaining orange. Mix the apple and orange in a bowl. On a small plate, stir together the sugar and cinnamon. Moisten the rims of wine glasses and dip in the cinnamon sugar to coat. Pour in the sangria until three-quarters full. Top with a splash of club soda. Garnish with a generous spoonful of the chopped apple and orange.